Last month, we reported on AMC’s plan to air a one-off Preacher chat show in the vein of its Talking Dead, Talking Bad, and Talking Saul post-show discussions. We lamented the fact that AMC was calling the special Talking Preacher instead of something mildly clever like Preaching Preacher or The Preacher Preach, but AMC’s commitment to the Talking brand is evidently stronger than its desire for puns. Thankfully, the USA Network’s hands aren’t tied by Talking the way AMC’s are, so it has just announced a live Mr. Robot after-show called Hacking Robot. Get it? Not only is “hacking” a big thing on Mr. Robot, but a group of people discussing the show and unpacking its plot could generously be referred to as “hacking” it, so it actually makes sense. Also, it kind of sounds like Talking Dead, which is a fun nod and/or dig at the other network’s series. 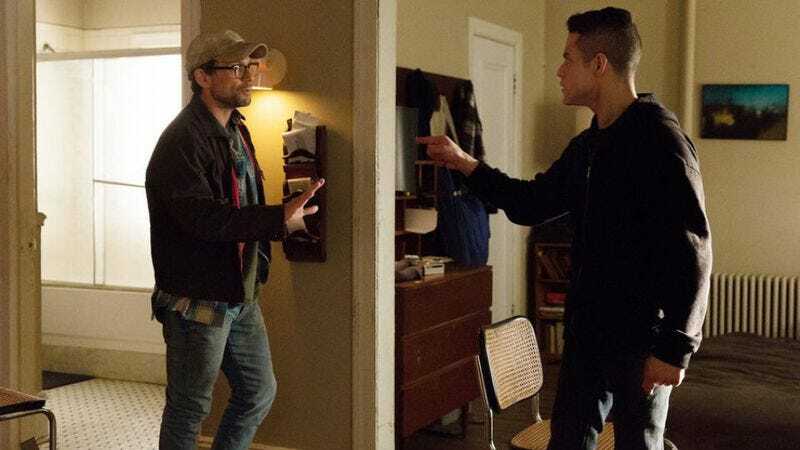 This comes from Variety, which says that Hacking Robot will be a one-time special that will be broadcast live immediately after Mr. Robot’s season two premiere on July 13. The story doesn’t say who will appear on Hacking Robot, but stars Rami Malek and Christian Slater seem like pretty safe bets. In other Mr. Robot news, Variety also says that the second season has expanded from 10 episodes to 12, with series creator Sam Esmail directing each one.